Official Synopsis : In the early summer of 1956, 23 year-old Colin Clark (Eddie Redmayne), just down from Oxford and determined to make his way in the film business, worked as a lowly assistant on the set of ‘The Prince and the Showgirl’. The film that famously united Sir Laurence Olivier (Kenneth Branagh) and Marilyn Monroe (Michelle Williams), who was also on honeymoon with her new husband, the playwright Aurthur Miller (Dougray Scott). Nearly 40 years on, his diary account The Prince, the Showgirl and Me was published, but one week was missing and this was published some years later as My Week with Marilyn – this is the story of that week. 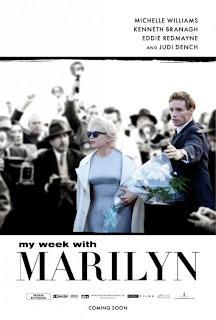 When Arthur Miller leaves England, the coast is clear for Colin to introduce Marilyn to some of the pleasures of British life; an idyllic week in which he escorted a Monroe desperate to get away from her retinue of Hollywood hangers-on and the pressures of work. Critical Response : Positive. While critics applauded Michelle Williams' performance, they also felt that the movie doesn't quite rise to the occasion, offering genuine entertainment, but never any real insight. Rated 81% on Rottentomatoes.com from 79 positive and 18 negative reviews. Starring : Michellew Williams, Eddie Redmayne, Kenneth Branagh, Emma Watson, Julia Ormond, Dougray Scott, Toby Jones, Judi Dench, Derek Jacobi, Dominic Cooper. Director : Simon Curtis (BBC's "David Copperfield"). Screenplay : Adrian Hodges ("Primeval"), based on Colin Clark's books. Rating : PG-13 for moments of intense violence and sexual content.